Mayhew International works with governments, local communities and charitable groups to help improve animal welfare overseas. We address issues around dog and cat populations in urban areas and changing attitudes towards animals. We currently work in four countries – Afghanistan, Georgia, Russia and India. Many of the places in which we work have large numbers of free-roaming animals living in their communities. Our teams are working to help both these animals and local pets and their owners. We are working to understand the issues behind free-roaming dogs and cats abroad. Reducing the number of dog transmitted rabies cases in Afghanistan. 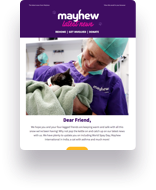 Mayhew International offers veterinary training, shelter medicine and management courses. Creating safer communities for animals and people. Veterinary surgeon, Mo, has been working with Mayhew for more than 15 years. He currently runs our Afghanistan branch and is working towards the eradication of canine rabies in Kabul, as well as managing and reducing the free-roaming dog population in a humane way. Mo has achieved some incredible milestones since he began working with Mayhew. Our Afghanistan operation was given NGO status and our strategy on eliminating rabies in Kabul convinced the local municipality to stop culling dogs. Mo’s dedication has saved the lives of many humans and dogs in Kabul. Thanks to his hard work, Mo was given the Association of Dogs and Cats Homes (ADCH) Special Recognition Award in 2017. They recognised his innovative work helping thousands of animals in both London and Afghanistan.